Aruba Ports Authority N.V. is a limited liability company established in 1981. 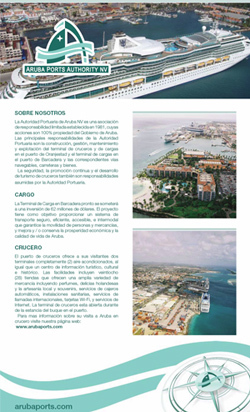 The aim of the Aruba Port Authority is to provide a safe, efficient, accessible, and inter-modal transportation system that ensures the mobility of people and goods, and enhances and/or preserves economic prosperity and the quality of life for the island. APA N.V. is responsible for building, managing, maintaining and exploiting the Oranjestad & Barcadera harbors and corresponding waterways, roads and assets. The security of all premises and the promotion and development of Cruise Tourism are also the responsibility of the Port Authority. The Port currently employs around 90 people and the stevedoring operation is leased out to a private contractor based on a concession agreement. The Aruba Ports Authority security patrols the harbor 24/7. APA is ISPS compliant and a DRUG FREE work place.